When Joash was young, his life was threatened. His siblings were murdered by Athaliah, his evil grandmother, who sought the throne of Israel for herself. But Joash’s life was preserved by his aunt and uncle. They hid him in the temple, quietly raising the boy for six years. He was only seven when he was crowned king and Athaliah was killed. 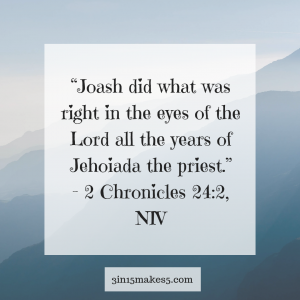 It was his uncle, Jehoiada the priest, who made sure Joash, the rightful king was crowned. But he didn’t stop there. He went with young Joash and led him in the ways of the Lord for as long as he lived. Maybe you’re busy running a household and being a parent. You may be tempted to think what you’re doing isn’t that important. But you carry far more influence than you realize. You may be shaping the next world leader, judge, or police officer. Today, you can’t see it, but you are equipping the next generation. What you’re doing not only matters – it’s vitally important. By pouring into little ones and raising them in the grace and love of Jesus, you may be influencing an entire nation. Lord, help me! Some days, I’m overwhelmed and tired and grouchy. It’s hard raising little ones. Give me the grace to be patient, the strength to be gentle, and the faith to carry on. In Jesus’ name, Amen.